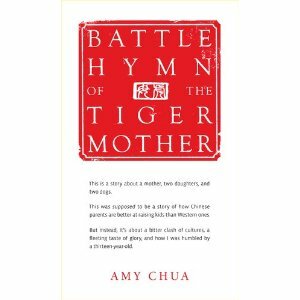 I was going to wait until I read Amy Chua’s memoir Battle Hymn of the Tiger Mother in its entirety (not just shocking passages quoted in the press) before posting, but given its exposure, I have to give some initial thoughts. I first heard of her book listening to an NPR review. This is an American-born woman of Chinese descent (her ethnically Chinese parents immigrated from the Philippines to the U.S.) who was determined to raise her daughters with the same values that she was raised. Practice and hard work make perfect. The stereotype is that Asian people are genetically predisposed at being skilled in say, math and science. She staunchly disagrees, pointing instead to very strict parenting that demands excellence in those subjects. Her parenting methods are harsh, extreme, and also limited (i.e., no sports, no theater, no art). The media uproar from an article featured in the Wall Street Journal (WSJ) has been unforgiving. I heard her say thoughtfully in a post-interview, “My parents told me never to blame others when you come under fire, so I won’t. 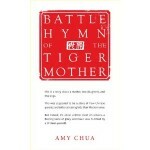 This author Amy Chua is absolutely fascinating and thought-provoking. No one, these days, cares enough to be honest with their readers. This is HER memoir (not ours) where she comes to terms with her aggressive methods. Also, I applaud someone who has the guts to tell her story raw and unfiltered. Consider also that everyone who has heard about her, read about her, is talking and thinking. That is a good thing! To think! And we wouldn’t be debating our parenting skills had it not been for her. Thank you, Amy Chua! Really quickly, I need to point out that the WSJ can no longer be considered a credible source of news. After the Murdoch takeover, the paper has become sensationalized and biased. My peers and I roll our eyes at the headlines. Honestly, I don’t read it anymore. Keep that in mind when you read the WSJ’s article on the book and how the newspaper operates under a veil of driving profit. Again, I will reiterate that I need to read the book and most of the people commenting negatively need to fully inform themselves before making rash judgements. But, I consider myself a future parent who prefers a hybrid approach. On some level, children need to be given a choice, but once that choice has been made, they have got to stick at it. They cannot buzz from hockey to the clarinet to tap dance. Then PRACTICE! Americans have lost sight of ingraining their kids with that immigrant work ethic. I may have been born on U.S. soil, but hell if I don’t drill in my kid the same values my parents instilled in me. trying to catch up on blog reading — hope you’re doing well!